Thanks to my school throwing out dead pixel-infested, but otherwise in perfect shape iMacs, I ended up with a lot of G5 Intel iMacs. The question, though, was what to do with them. Despite never having any practical use for one, I had always wanted to build a computer cluster. After surfing the web for a while I found some great free software and set about building my cluster. Hardware-wise it couldn’t be simpler. The 4 iMacs are all connected over Ethernet and the central computer displays the results and sends out the tasks (it is the one with a monitor hooked up to it). The only issue was that since all the iMacs had dead screens making any changes to their settings meant unplugging the monitor, mouse, and keyboard. What I also found online quickly fixed this. I downloaded Chicken of the VNC, which allowed me to remotely control all of the computers from the central computer with the monitor. 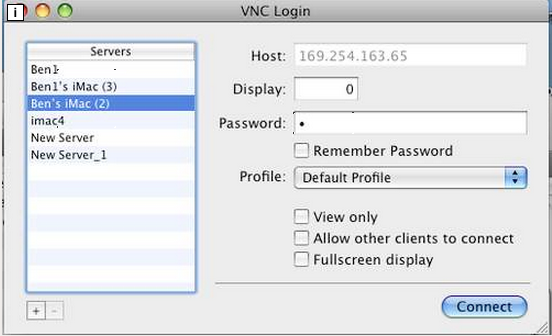 To configure go to System Preferences>Sharing>”Check” Remote Management>Computer Settings>Set Password for VNC. Now that each computer was ready to go I downloaded the free cluster software from Dauger Research, clicked “yes” and “I agree” and everything was up and running. It drastically cut down the time for using Fresnel Explorer (versus the single computer), but sadly I had no daily use for it and I needed the desk space back. Just be sure when running the programs to check the option for cluster mode, because for some reason they default to running the program just on the computer you are using. For anyone out there, though, a cluster is easily within your reach. A nice benefit to using this software is that you can write your own custom programs for it.